sailboat. : Make Up Bag: March 2015. March is going to be all about simple, fresh looking make up. My skin isn't the best at the moment but I don't want to try and cover everything with heavy foundation and powder. Instead I would like to find a nice lightweight base (I'm thinking perhaps the NARS Tinted Moisturiser?) and not go too overboard with colour on my cheeks or lips. This is something I've had in my collection for a little while and it deserves to be shown some love again. It's a really pretty, incredibly wearable neutral pink colour and the cream formula feels so light and looks really fresh on the cheeks. I'm not totally sold on the scent but the colour is incredibly beautiful and easy to wear. I can't wear lipstick anymore without looking much older than I am so glosses have become my new best friend. I especially like the squeezy tube, it doesn't look fancy or expensive but it's so convenient! My skin has been really frustrating recently. Foundation never seems to sit nicely so I'll be incorporating this back into my daily make up routine again. It can sometimes feel a little heavy if I apply too much, but it really helps to smooth everything over. » Illamasqua Unrequited is a pretty pale pink blush. Sometimes it's not the easiest colour to wear but I still like it. » I'm happy to have finished the Rimmel ScandalEyes Retro Glam mascara, it takes forever to dry on my lashes. » Lily Lolo glosses are possibly my very favourite and English Rose is a beautiful muted pink that I've enjoyed wearing. Are you going to switch up your make up for spring? I like the Burts Bees glosses, they surprised me with how nice they are. I love Burt's Bees products, this colour gloss looks cute! The gloss and balm are such pretty shades! I've never tried Burt's Bees, how I'm not entirely sure. 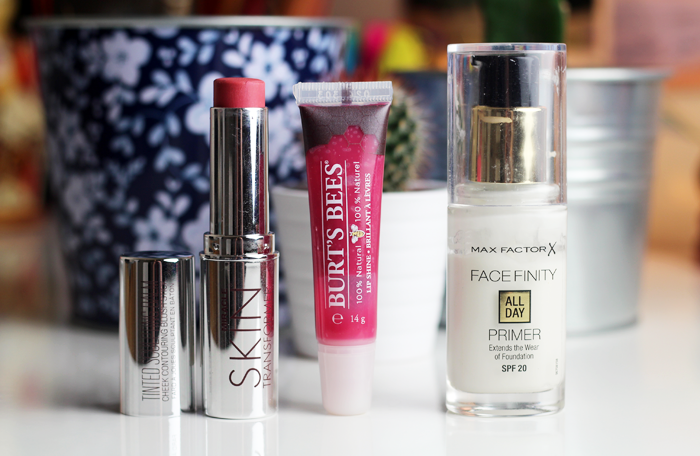 Would the Max Factor primer work for oily skin types? Wow quite a few products I'd love to put in my own bag, especially the Burt's Bees balm and the Max Factor primer.